Our latest campaign on site has recognised the issue that the recent clock change has presented. Being committed to safety is always our main priority and this campaign is especially relevant because it is relevant on and off site, for our employees, subcontractors, neighbours and even our families. To raise awareness that as the clocks go back, statistics show that fatalities rose by 17% in 2015, this is relevant to all motor vehicle drivers, plant operators, delivery drivers, cyclists and pedestrians. 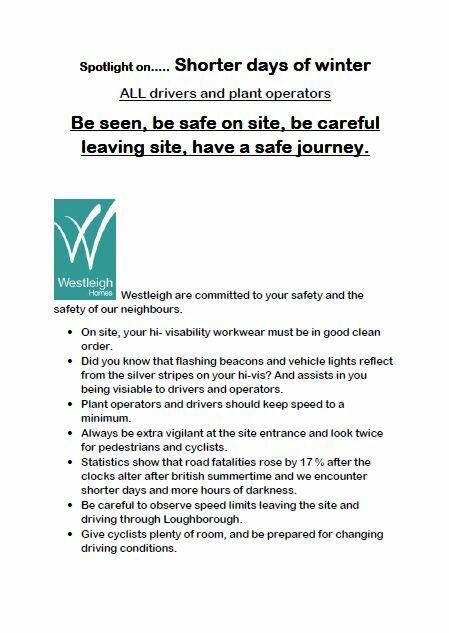 Our newsletter, which has been handed out to all drivers on site gives some valuable information, noting that hi visibility clothing in good order and also low site speeds can prevent accidents, but also that being vigilant at the site entrance and on the journey to and from the site is extremely important. All of this promotes our awareness of safety throughout the shorter days, both on site, off site and in the town we are working.